“I have. And one day, I’ll show the world. And they’ll never forget me. Imagine listening to an extremely boring lecture in your school; sitting in those uncomfortable seats with your friends, talking and whispering. Doing pretty much anything other than actually listening to those speeches that drone on forever. Imagine your everyday life. Boring, uneventful, normal. Now imagine someone you know standing up, revolver in hand with their morals and compassion flying loose like they never existed. Imagine a trigger happy person with just one agenda – revenge. “Today, all of you belong to me.” The outside world no longer matters. Told in varying perspectives, This Is Where It Ends takes us a beautifully portrayed emotional rollercoaster that will leave us gasping for a breath of normality once it’s over. This Is Where It Ends is about a boy that felt that nobody understood him; that everybody had stolen something from him and that it was him against the world and it’s told in the perspectives of these people- the ones that he thinks abandoned him of left him alone. This Is Where Ends is about this one place that you don’t realize is home to you – and how that one place; the one you grew up in – is what makes you or breaks you. Told in a span of fifty four short and yet long minutes- a time period too short to lose that many loved ones, but too long to survive through anyway, This Is Where It Ends is simply heart breaking. It shows us what life really is, how we think we have time but in the end, we never really know anything. 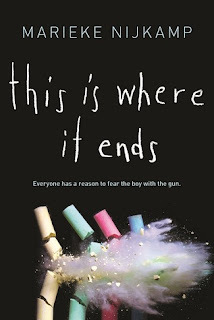 This Is Where It Ends is gorgeous, it’s soulful, and it’s real. It’s everything I thought it would be, everything that the author probably envisioned it to be- maybe even more. I couldn’t give a book of this genre a higher recommendation- READ IT! I'm planning to read this one, just not right away. There have been lots of mixed reviews, and I need to read it for myself. Great Review!